王艳丽, 李晓庆, 王忠宇, 吴兵. 面向出口匝道拥挤的快速路速度协调控制模型[J]. 同济大学学报(自然科学版), 2018, 46(7): 905-912. DOI: 10.11908/j.issn.0253-374x.2018.07.007. Abstract: In order to mitigate the traffic congestion around the off-ramp, the speed harmonization control method of main line is proposed. Based on existing section-based speed harmonization model, a lane-based speed harmonization model was designed with factors of on-ramp and off-ramp. The model can describe and forecast the traffic state, and give the optimal speed on each lane with shortest travel time as well as maximum total through traffic volume. Finally, the simulation system was developed to scientifically evaluate the effectiveness of lane-based and section-based speed harmonization model in different traffic demand situations. The simulation results indicated that, speed harmonization strategy is more adaptive for medium and high traffic flow density. When traffic demand is high, both of lane-based model and section-based model can reduce the vehicle average delay compared to no control strategies, and in most cases, the lane-based speed harmonization model is superior to the section-based model, which is helpful to mitigate traffic congestion and improve traffic safety. 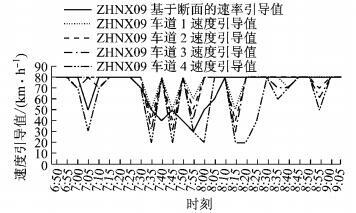 式(10)~(12)中：m为路段编号, m=1, …，M, M为最大路段编号; n为车道编号, n=1, …，N；N为路段m上总的车道数; k为数据采集时间序列编号; qm-1, n(k)，qm, n(k)，qm+1, n(k)分别为上游路段、当前路段、下游路段上车道n的流量，veh·h-1；ρm-1, n(k)，ρm, n(k)，ρm+1, n(k)分别为上游路段、当前路段、下游路段上车道n的密度，veh·km-1；vm-1, n(k)，vm, n(k)，vm+1, n(k)分别为上游路段、当前路段、下游路段上车道n的速度，km·h-1；rm, n(k)为上匝道车流分配到路段m第n个车道的汇入率，与总入口匝道流量成比例，veh·h-1；um, n(k)为路段m车道n上的速度引导值，km·h-1; Lm, n为断面m车道n的长度，km. 式(13)~(15)中：θm, n为上匝道车流分配到断面m车道n的汇入比例; umf, nf(k)为出口匝道上游邻近断面最外侧车道的速度引导值，km·h-1；umf1, nf1(k)为虚拟直行车道的速度引导值，km·h-1；umf2, nf2(k)为虚拟下匝道车道的速度引导值，km·h-1；β为最外侧车道的直行车流比例；ρmf+1, nf(k)为虚拟下匝道车道下游密度，veh·km-1；ρoff(k)为出口匝道的密度，veh·km-1. 在计算之前，需对式(12)中的参数τ, ν, φ进行标定.在标定过程当中，使得模型计算值与实际测量值的误差最小，如式(21)所示.其中参数向量B=[τ, σ, φ]的范围需满足式(22)和式(23). 式(21)~(23)中：B为待标定参数τ, ν, φ的向量；Bmin为相应待标定参数的最小值；Bmax为相应待标定参数的最大值；vm, nmea(k)为每个断面每条车道实际测量的速度值，km·h-1；vm, npre(k|B)为在特定参数下模型所计算的速度值，km·h-1. 最后，基于实际数据对模型的车速分布、驾驶行为等参数进行标定，并对模型的初始参数和交通流模型参数进行标定.其中:①各车道入口匝道汇入比r1:r2:r3:r4=0:1:3:6；②1.0倍、0.9倍、0.8倍、0.7倍、0.6倍、0.5倍的交通需求下的虚拟车道直行比例分别为0.10、0.15、0.20、0.24、0.27、0.28；③瓶颈断面的通行能力Qb=3 420 veh·h-1，内侧两车道Q1b=Q2b=960 veh·h-1，外侧两车道Q3b=Q4b=750 veh·h-1. 马继萍. 快速路出口匝道控制策略研究[D]. 西安: 长安大学公路学院, 2013. WALLER S T, NG M, FERGUSON E, et al. Speed harmonization and peak-period shoulder use to manage urban freeway congestion[R]. Texas: Texas Department of Transportation, 2009. LI D, RANJITKAR P, CEDER A. A logic tree based algorithm for variable speed limit controllers to manage recurrently congested bottlenecks[C]// Transportation Research Board 93rd Annual Meeting. Washington D C: Transportation Research Board, 2014: 1-14.